Lying in the southwest of Kunming, Dian Lake is 40 kilometers long from north to south, 7 kilometers wide from east to west. The widest point is 12.5 kilometers. The lake is 1886 meters above sea level and the lakeshore line is about 150 kilometers long. It offers a variety of landscapes by the lakeshore, such as Cuihu Lake, West Hill (Xishan Forest Park), Daguan Park with old buildings and Zhenghe Park in honor of Zhenghe. From November to March, black-headed gulls always gather at the lake from Siberia. At the period of time, you will see hundreds of black headed gulls playing at the lake. If interested, you can feed them with some bread. Other attractions are situated near Dian Lake. If you enjoy climbing, it is recommended that you explore West Hill (Xishan Forest Park) by the western bank of the lake. At the park, you will find several old buildings hidden in the green forest. In addition, you will find the amazing stone carvings on the wall of the hill, such as stone chambers, stone incense burner, stone candleholder, etc. In March, locals will gather at the hill to do Lion Dancing and perform other types of shows. If you would like to experience local life, you could walk along Guanjing Road at the eastern bank of the lake. Daguan Park on the north of the lake offers various types of cruise boats to tourists to take a close look at Dian Lake on the lake. Originally built in 1682, the park offers old buildings in the Ming (1368 - 1644) and Qing (1644 - 1912) Dynasties styles. At Haigeng Park at the eastern bank, you will see colorful sculptures. Guanyin Mountain standing at the middle section of the western bank is home to 25 species of rare animals and 15 species of rare plants, suc as spinulose tree fern, Alcimandra cathcardii Dandy and slow loris. If you are planning to visit Dian Lake for photography purposes, the best time is during the sunrise and the sunset. You can visit the lake at any time around the year. If you are planning to see black-headed gulls, you could visit the lake between November and March. 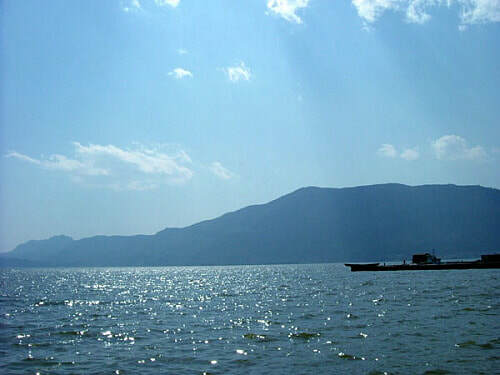 As the lakeshore winds through Kunming, you could get to any attraction along the lake. Therefore, there are several options. Take Bus 24, 44, 233 and Bus 73 to the Stop of Haigeng Park (海埂公园). Take Bus A9 to the Stop of Nationalities Village (民族村). As at 9th January 2019, the entrance pricing is free of charge. If interested, you could take a round-trip cable car between West Hill and Yunan Nationalities Village crossing above the lake. Interested in visiting Dian Lake on a Tour? Wendy Wei Tours offers a variety of different packaged tours as well as custom tours including Dian Lake, among other attractions and destinations. To find out more, please visit our Tours page or Contact Us directly to find out more.